I have been using these colors together quite often. I am using it again for Beate’s wsc #56. I couldn’t resist! Love them (riding hood red, kiwi kiss, pink pirouette, and chocolate chip). I flipped todays sketch because it just wasn’t working for me. When I made it the way the sketch shows to, I discovered that my strip of cardstock and ribbon was just too close to the center….if you tilt your head towards your right shoulder and look at my sample, you’ll see what I mean LOL. Another reason why I wanted to use this color combination again was so it would coordinate with these mini “hi” cards I made to send to my customers. Very simple except if you add the “hi” to the inside of the card. I had to because it coordinates perfectly with the hi on the card front. Will be back in a little bit with another creation to share. CARDSTOCK: Pink Pirouette, Chocolate Chip, Whisper White, Riding Hood Red. ACCESSORIES: Flower Fusion Too; Crafters’ Tool Kit; Riding Hood Red 5/8″ Striped Grosgrain Ribbon; Kiwi Kiss/Very Vanilla Satin Ribbon; Button Bouquet Designer Buttons; Scallop Square Punch; 1/2″ Circle Punch; Scallop Edge Punch; Stampin’ Dimensionals; White uni-ball Signo Gel Pen. Another amazing project! 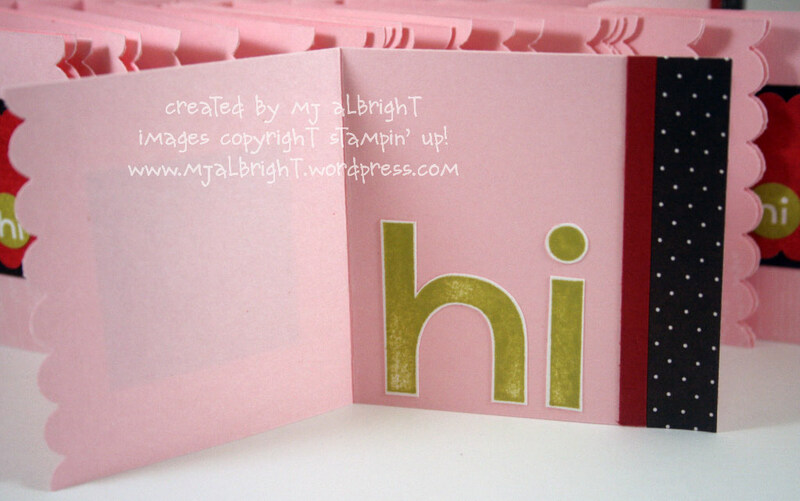 Those “hi” cards are just so precious – your clients are going to be very happy to receive those! P.S. Congrats on the new Artisan Award gallery – it looks awesome and I’ll be looking forward to your monthly posts! Very very pretty! LOVE the colors! Love the mini cards! Do you mail those to your customers “just because” or when they order or hostess a workshop, etc.? Yes, what a great color combo, MJ — love it! Your little notecards are adorable — another great twist on the sketch! What lucky customers you have! Your card looks wonderful! The customer cards are adorable. Love all the details in both cards. I love the color combo and the way you added popped up/out the hi. yes, this is definatly a very nice color combo… will give it a try too…. thanks for the inspiration and so WELL DONE!!!! Very pretty! I love this color combo too, looks great! Absolutely FABulous! I love your take on the sketch, the colors are so perfect together. Your customer cards are simply adorable!!!!! I had a question. How did you get just the flowers white? I love your your card and have not been able to figure out how you did that.